R1996. John C. Taylor. 47", ML. Registration description indicates cream standards edged pink with a darker central rib; buff falls with a rose pink spray pattern darker toward edge; buff styles and a yellow signal. To my eye, there is a rich brown tone that darkens the rose pink, and a glowing gold around the signal. 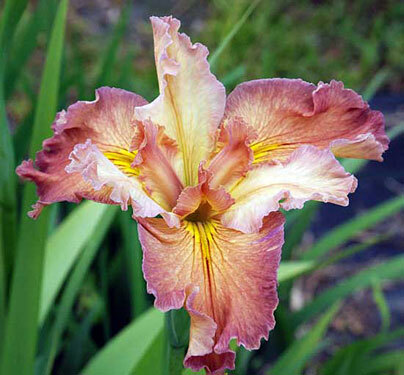 Desert Jewel x Dural Dreamtime.